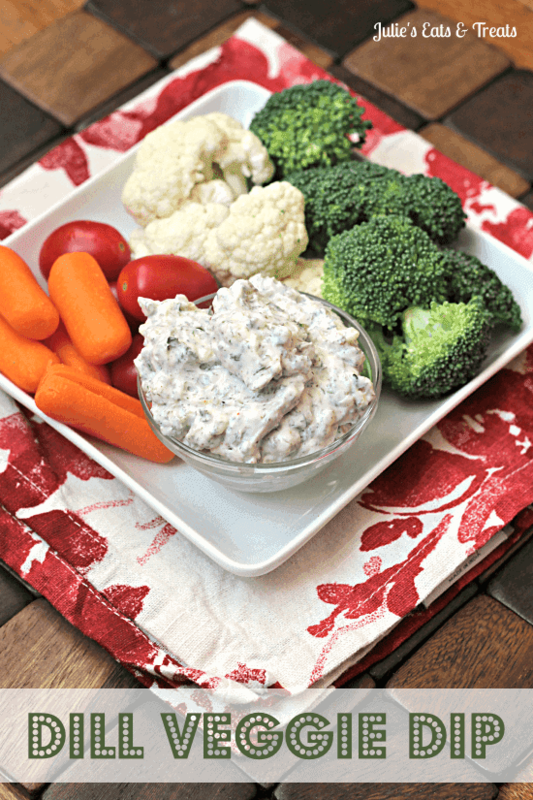 Dill Veggie Dip ~ This dill dip is so amazing you’ll want to eat it by the spoonful! I like veggies and all but I usually don’t get excited about a plateful of raw carrots, broccoli and cauliflower. Unless this amazing dip is accompanying them. Then I pretty much want to do cartwheels and handstands and lets just say I don’t do either of those two things. Ever. This dip is so amazingly easy that anyone can seriously make it. I mean my husband can probably make it. In fact I know he can and I don’t say that about many recipes. Or maybe he just leads me to believe that he is incapable in the kitchen because now that I recall he does cook supper, or did, previously in the weee beginings of our marriage when I worked later then him. Hmmmm…. Just make sure to use the 80/20 rule…that’s 80% dip and 20% veggie! 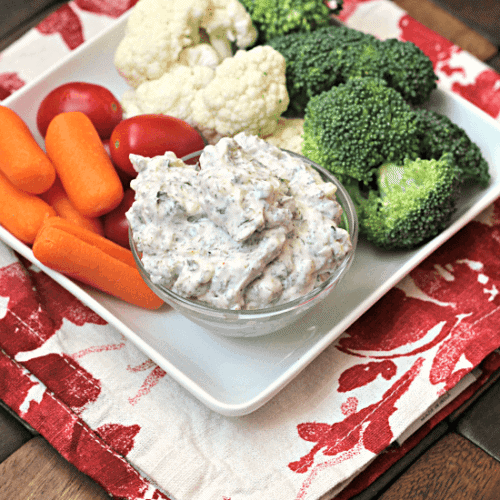 Dill Veggie Dip ~ This dill dip is so amazing you'll want to eat it by the spoonful! Refrigerate for several hours or overnight. Serve with vegetables. This ROCKS. I LOVE dill sauce/dip. It’s one of my favorites! I totally want this bad boy shmeared all over a crusty baguette! This looks so perfect for our next barbecue! Thanks for linking up to What’s Cookin’ Wednesday! Are these fresh herbs or dried? what does it cost to subscribe to your newsletter? I made this dip last Saturday for a going away family & friend dinner for my son as he will be leaving on 11/28/16 for Marine Boot Camp for 3 months. I used fresh Dill/Parsley and onion powder as several people do not like dried onions. This dip is best if made the day/night before you plan to serve it. It was a hit and everyone enjoyed it!! My aunt called the next day asking for the recipe so my uncle could pack some for his lunch with fresh veggies as a snack. This recipe has a new home in my collection box! Thanks for sharing! I’m so glad you enjoyed it! Also, tell your son THANK YOU!! !